Senegal 2010 - the Team Win Song! 7 hour wait what a pain. We will always be as one. No film, what a pain. Fought our way through the crowd. Sword was real, not a toy. So we ran away from him. In all our hearts since she left home. Senegal 2010 - Day 14 (Tues.) - farewell to Senegal! Well, all good things come to an end, and so it was that the day of our journey back arrived. That morning we presented to the Brothers at Diourbel (including the community Superior, Frère Jean-Baptiste who had come back the day before from Brothers' meetings in Togo) a data projector, dvd player, amplified speakers and a couple of dvds: the same setup that we used and left in Richard-Toll. The Brothers were delighted at the possibilities that the equipment offered for use in their secondary school there. 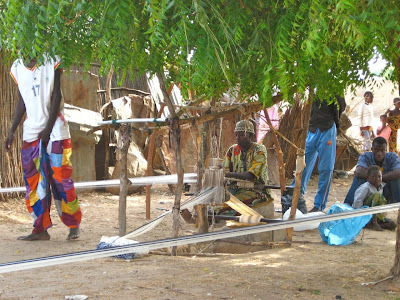 We also left them our 12 mosquito net tents that we had been using. The Brothers were going to pass them on to some of the 45 or so boarding pupils they who either don't have nets or have very poor ones. They assured us that these would make a real difference to the young people and would be very much appreciated. Upon arrival at Diourbel in the early evening we off loaded the bus, set up our mosquito nets + beds for the night, then set off on foot for a nearby restaurant, guided by Frère Augustin (from Togo) and Frère Adolphe (see previous article). In the meantime, whilst waiting to go to our rooms/dormitories with our bags, I managed to bang my head on a low-hanging, knobbly beam of wood and open up 2 wounds on my scalp. I've always been a bit of a "bleeder", so the flow of crimson was quite dramatic. But other than seeing stars for a few minutes there seemed no serious damage. Good thing I've a thick Irish skull, I suppose. A layer of Germolene was applied and I was ready to go and eat with the others - hamburgers, roast chicken, steak, chips!! Team Win couldn't believe their eyes! An end-of-trip indulgence, but one they thoroughly deserved. So, after having spent a wonderful 9 days at Richard-Toll, we now headed for Diourbel, a 5-6 hour road journey. 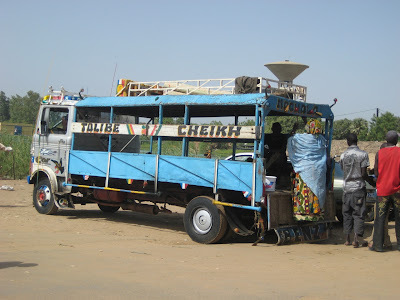 But the plan was to do a little tourism on the way at Touba, a town which has grown in recent years (and is still growing) to become one of the biggest and most important in the whole of Senegal at well over 500,000 inhabitants. 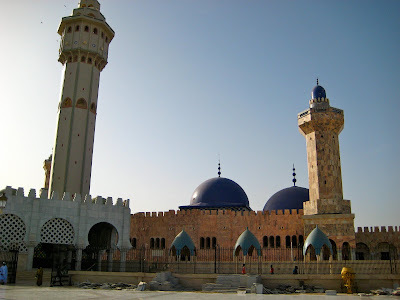 It's growth can be attributed to the importance of its Great Mosque, completed in 1963 and possibly the biggest in Africa outside of the northern white Arab countries. Frère Adolphe, a French Brother in community at Diourbel (1 hr from Touba) came to meet us there and organised for us to have a tour around the mosque with a guide. Before I tell you about our last half day at Richard-Toll, after which we headed for Diourbel, let me tell you about a hilarious incident that took place on Friday night. Remember that I described how the (rather self-important) local parish priest at Richard-Toll had a habit of rabbiting on for +45 mins. in his sermons, as well as giving supplementary sermons at both the beginning and end of Mass, well, he got a polite, but nonetheless pointed telling off from our very own Bro. 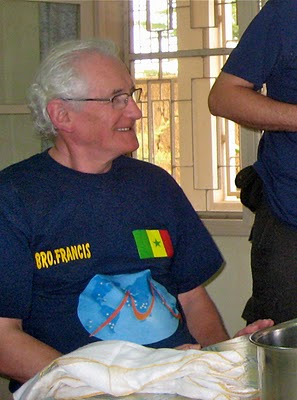 Francis on Friday evening after the priest had come to the Brothers' community house to celebrate Mass as he does every Friday. With him were the curate, a lovely young Nigerian priest, Fr. Charles and another young priest who had served as a Deacon in the parish a year or 2 ago and is now in a parish in the capital Dakar. - we did indeed pick up our tailored shirts and trousers on Thurs. Each item (material + labour) cost roughly £4-5. I think we would have been prepared to pay much more given the quality of the tailoring and the material, but our priority was to leave as much of our funds as possible to the Brothers in Richard-Toll, so we just paid the price we were given. See below for a photo of some of the group in their new togs.